Students protesting in Valencia. Photo by Nicholas Hegel McClelland for TIME. Thousands of demonstrators turned out in European cities on Wednesday to protest against austerity measures. 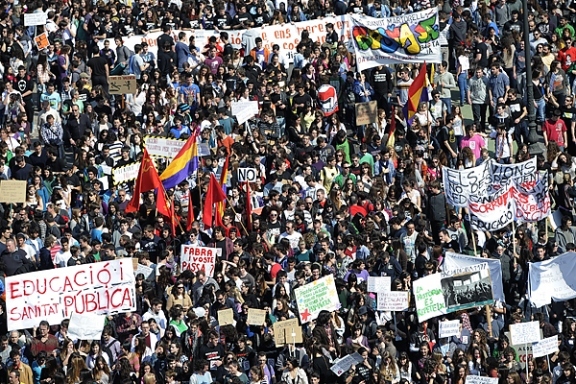 In Spain, students across the country staged sit-ins and noisy demonstrations over crisis spending cuts, labor market reforms and recent police violence against protesters. Meanwhile, unions staged demonstrations in Paris, Athens, Lisbon and Brussels. Several thousand supporters of two-time President Jean-Bertrand Aristide filled the streets of Haiti’s capital Wednesday on the eighth anniversary of his ouster, accusing the country’s current leader of not doing enough to improve their lives. Students, educators and Occupy Wall Street activists held demonstrations Thursday across California to protest state budget cuts to education, partially shutting down at least one campus, the University of California, Santa Cruz. Some University of Florida students gave low grades Thursday to faculty member and state Senate President Mike Haridopolos, filling out evaluations criticizing his support of university budget cuts and taping them to the front of UF’s administration building. Dozens gathered outside the Timms Centre at the University of Alberta on Thursday where Nestlé CEO Peter Brabeck-Letmathe was being awarded an honorary degree to protest the company’s efforts to privatize water. More than 100 Ohio State students held a protest on Thursday against growing college costs and what they say is increasing administrative pressure to run the university like a business. About 200 Arcelor Mittal workers from across Spain protested on Thursday against a decision by the company to close its steel factory in Madrid. Around 200 residents of Kenya’s coastal island of Lamu protested on Thursday against a planned huge port to be constructed near the UNESCO-listed isle, accusing the government of ignoring their concerns. About 10,000 demonstrators took to the streets Thursday in northern Azerbaijan to protest alleged corruption by a district official.